In Lot Lot, you directly control one arrow and indirectly control another which follows after your original arrow with a (roughly) four second delay. When you press the button, any balls on the compartment that one arrow points to are immediately swapped with the contents of the compartment that the other arrow points to. 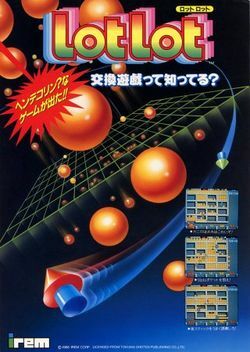 The goal of Lot Lot is to get as many tiny balls (which resemble Pachinko balls) out of grid compartments and down into point slots in order to achieve a designated score, and advance to the next round. Joystick: Use the joystick to guide the arrow that you have direct control over throughout the screen. In four seconds, the other arrow will follow the exact same path that the first arrow traversed. Button: Whenever the button is pressed, the contents of the compartments that each arrow points to are immediately swapped. 1-2 Players: Press to start a one or two player game. 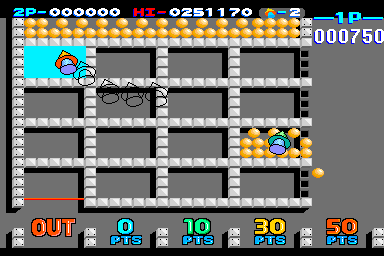 The game begins with the top row above the grid filling up with balls. From time to time, the walls and floors between grids will disappear, allowing balls to flow from one compartment to another, or out to the 50 point column. Gravity is always in effect, pulling the balls downward. If a ball has room to slide left or right, it will do so continuously. As you move one arrow around with the joystick, the other arrow will follow along in the exact same path, but on a four second delay. When you press the button, any ball contained by one compartment will be instantly swapped with the contents of the compartment that the other arrow points to. You score points for every ball that falls down into a particular point column. The goal of each stage is to achieve a high enough score to advance to the next stage. At all times, you must avoid allowing any balls to occupy the compartment directly over the "OUT" column. If any balls occupy that compartment, Sir Snips the Crab will slowly rise out from the bottom, and attempt to snip the wire holding up the balls. If he succeeds at causing the balls to drop into the "OUT" column, you lose one chance. If you swap balls out from that compartment, Sir Snips will retreat to the bottom of the screen. Red balls will occasionally appear. A red ball can pass through the open floors, but not through the side walls. It will block the passage of any other balls through the sides. If a full compartment of balls which includes at least one red ball drops through the middle three columns, you will be awarded a 5000 point bonus. These are pictures of the various home conversions. This page was last edited on 23 December 2008, at 02:16. This page has been accessed 6,439 times.